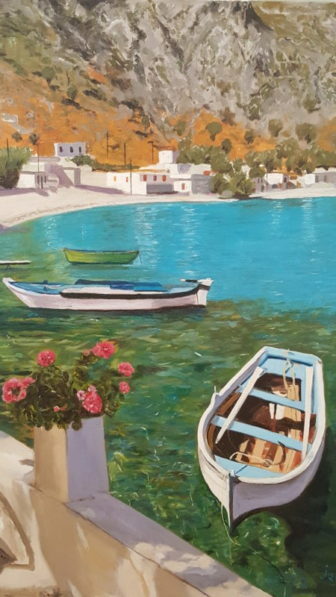 Paintings by Jacky Fromentin, a French immigrant and retired chef, will be on display daily in the Gratia Gillespie Art Gallery at Atria Darien, 50 Ledge Road, through the month of August. “Canoes” by Jacky Fromentin. His artwork will be on display through August at Atria Darien on Ledge Road. Fromentin, who now lives in Connecticut, was born in the heart of Normandy in France’s lush countryside. He first learned cooking from his mother, who worked the land and kitchen of their modest hotel-home. Jacky went on to apprentice in Paris as a teenager, quickly progressing to work at the prestigious Plaza Athenee. When offered the chance to travel the world as a chef on the reputed French navy vessel, La Jeanne d’Arc, Jacky seized the opportunity. The decision gave him his glimpse of the United States; sparking a fire that would bring him back to New York to live and work as an experienced French chef. A graduate of the Culinary Institute of America and a decorated award winner in his field, Jack retired in 2016 to continue his love of painting, a passion he’s nourished since the 1990s. Having appreciated the artistry and esthetics of presentation in cooking contests, Jacky transformed his love of beautiful scenery around the world into a peaceful pastime to counter his fast paced career. He specializes in oils and landscapes and is inspired by nature. Atria Darien Senior Living will showcase the works of local artist Joseph Lamorte, a career artist involved in advertising as an illustrator and art director. A gallery opening and wine reception will be held from 5 to 7 p.m., Thursday, April 4, at Atria Darien, 50 Ledge Road. Atria Darien invites you to an opening wine and cheese reception at 5 p.m., Thursday, Oct. 4, celebrating the work of nearby artists Nash Hyon and Nancy McTague-Stock.